Renowned soloist, chamber musician, specialist in historical horns & principal of a number of leading international period instrument ensembles. Hello! I’m Anneke and I specialise in all the weird and wonderful historical members of the (French) horn family. I’m a real enthusiast about the history and performance practice of our instrument - I have a collection of over thirty horns, some dating back as early as the 18th century, all which help me gain insight into the music that us horn players get to play. As a performer I’m frequently to be found as principal horn of a number of the leading period instrument ensembles worldwide such as Sir John Eliot Gardiner’s Orchestra as well as having a very active solo and chamber music career (see CV below for a fuller picture). I also have many years experience as a teacher working with student musicians from all sorts of backgrounds. I was the horn tutor at the Junior Department of Trinity Laban Conservatoire of Music and Dance (London, UK) and have, literally, taught horn players from the age of 8 to 80. Today, most of my teaching work focuses on students of the various “period instrument” horns with me teaching at the Royal Welsh College of Music and the University of Birmingham as well as frequently giving international masterclasses at institutions such the Berlin Hochschule, Paris Conservatoire, Royal Northern College of Music, Royal Irish Academy of Music, DIT Conservatoire of Music and Drama, University of North Carolina, Sydney Conservatorium, Centro Superior de Música del País Vasco San-Sebastian (Musikene) and many others. I have great experience with working with professional horn players who have wanted to learn more about the historical instruments in order to bring aspects of the earlier styles into their modern playing. I also hugely enjoy working with adult amateurs and am the horn tutor on the annual Malvern Wind Chamber Music Course (with Cullin Sound) as well as the annual Benslow Harmoniemusik Weekend (with Boxwood and Brass) and the Benslow natural horn days. If you’re either a horn player looking to learn more about how to play the earlier generations of the horn (baroque natural horn, classical natural horn, early valve horns) or if your a modern instrument horn player looking to learn how aspects of the early instruments can inform and educate your playing on the modern instrument I’m very much looking forward to working with you! International performances and recordings with renowned period instrument ensemble. International performances with renowned period instrument ensemble (including solo concerti). International performances and recordings with renowned modern/period instrument ensemble. International performances with renowned period instrument ensemble. Postgraduate studies specialising in period performance. Mastère-Métier de l’Orchestre Classique et Romantique. Professors: Claude Maury and Martin Mürner. 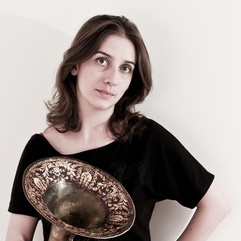 Anneke is undeniably passionate about period hand horn playing and the repertoire for the instrument and it follows that her knowledge of the technical aspects of the instrument and the nuances of the musicality required to play its music is pretty inspiring. As a teacher she is generous with her time, kind and thoughtful in lessons but not afraid to push a student where she thinks that student capable. Take live online video lessons with professional, passionate Horn teachers from around the world. All you need is a computer equipped with a webcam and microphone. Learn more about how it works.